-Here we have the listings of books / magazines / etc. which feature Wayne W. Johnson as a musician (that we know of). Check for their availability via the STORE page. 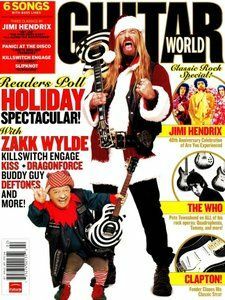 The February 2007 Issue of Guitar World Magazine features CAROLINE BLUE vocalist / guitarist Wayne W. Johnson (labelled here as “Wayne M. Johnson” for some unknown reason) in the “Defenders of the Faith” section.